The Sudbury Valley School Handbook contains the central documents defining the structure of the School. 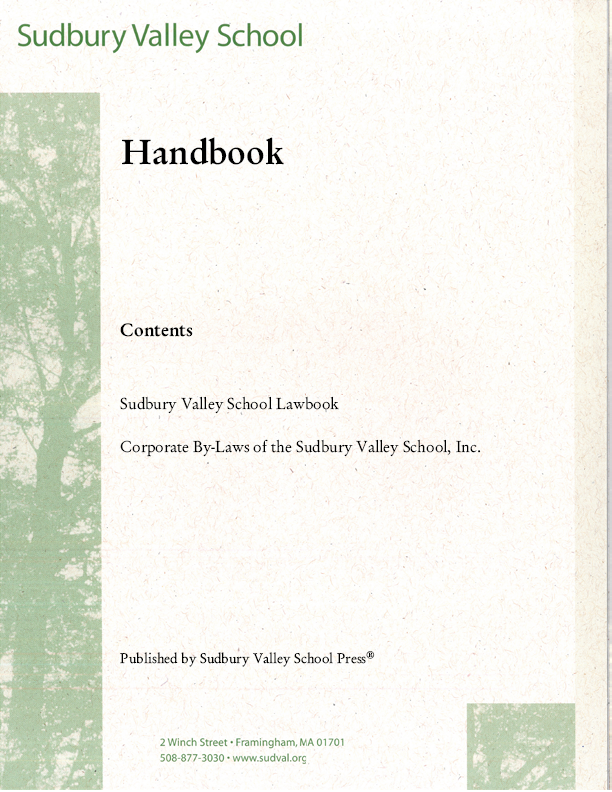 These are the Sudbury Valley School Lawbook, and the Corporate By-Laws of the Sudbury Valley School, Inc. The School Meeting has full authority to run the school and it does it all: it makes policy, prepares the budget, appropriates funds, hires the staff, passes all the school rules (the permanent rules are codified in the Lawbook), oversees discipline, and sets up administrative entities to keep things running smoothly. It is presided over by the School Meeting Chairman, who is also the President of the school Corporation.